I think I said my next post was going to be Martial again. Well, yes and no. I’ve written before on the impact of the First World War on my college, but the most famous Great-War soldier from Brasenose was the British Commander-in-Chief himself, Field-Marshal Douglas Haig, perhaps the most controversial figure the war produced. An undistinguished student at Brasenose from 1880 to 1884, Haig emerged with a Pass degree, despite apparently spending most of his time at Oxford on horseback, but received tutorials from, among others, Walter Pater; at which the mind truly boggles. Oxford colleges, like every other British institution, were traumatized by the war, and when hostilities were finally over faced the same challenge of creating a memorial equal to the enormity of what had happened. Brasenose’s response should certainly strike us as peculiar, but it clearly made sense to the fellowship at the time. This last one went up first, and was in place just inside the main gate by November 1920; the wooden memorial in the chapel followed sometime between then and May 1921; while Orpen’s portrait of Haig, after appearing in the Royal Academy Summer Exhibition in 1921, was hung in Brasenose Hall in January 1922. It was placed, significantly, on the east wall of the Hall, where images of the founders and most significant figures in College history are located. The painting had been partly funded by subscriptions from old Brasenose students, each of whom received a “photogravure” copy, a print, of Orpen’s work. The striking thing, of course, is how unapologetically proud the College was of Haig in the immediate aftermath of the Great War, and to what extent he dominated Brasenose’s act of commemoration. This Brasenose man was the hero that had let the country to victory, the thinking seems to have been, and giving him the prominence he got was only appropriate. Needless to say, the oscillations in Haig’s reputation over the years didn’t leave that confident assessment undisturbed. Stories are told about the portrait in Hall, though I’m not sure how true they are: that at a later stage it was removed from display, and only rehung when a descendant of Haig had happened to arrive as an undergraduate. It was certainly moved from the east wall, and now hangs in another corner of the room, quite easily missed. An urbane account that omits as much as it says. You don’t take down a war memorial just to make space for a noticeboard, but then again you do take down a memorial lionising Field Marshal Haig in 1969. The Sixties had seen the First World War, at its fiftieth anniversary, returning to public attention, and Haig did not emerge well from it: there was a classic TV series, The Great War (1964), books like Alan Clark’s The Donkeys (1961) and A.J.P. Taylor’s The First World War: An Illustrated History (1963), and the musical Oh! What a Lovely War (1963). The dominant narrative became the one still familiar to us, lions led by donkeys. The film version of Oh! What a Lovely War was released in 1969, and did more than anything to crystallise the perception of Haig as a callous, upper-class buffoon, who was bound to be an acute embarrassment to his alma mater. It’s not so much that Haig is back in favour, though it’s true that more recent trends in Great War historiography make him a less toxic old member than he used to be. Really Haig’s back up there because it’s the centenary and it isn’t really acceptable to have a memorial, of any kind, hidden under a tarpaulin. Well, that’s my impression. But just as the original commemorative plan in 1919 tells us fascinating things about how the war could be regarded in its immediate aftermath; and just as measures taken in 1969 characterize very vividly the view of the war and authority in general that prevailed fifty years later: so the recent re-erection of Haig’s memorial is a more complex, and telling, gesture than it may seem. It certainly hasn’t been returned to the College lodge. The place chosen for it might, to the uninitiated, seem equivalent to its original location: by a gate leading out onto High St. But in fact this is a very quiet part of College, and the gate isn’t used by students. In other words, the inscription has been placed in a position that looks like it’s on everyone’s route, “that those who pass may be put in mind of Field Marshal Earl Haig,” but is in fact well off the beaten track. An entirely appropriate location for Field Marshal Douglas Haig in 2014, in other words. I know you are in Twitter so maybe you should follow Prof Gary Sheffield. He is one of the leading WWI historians and would be interested in this post, but would argue vehemently that your college has got Haig very wrong in terms of his leadership skills. It should be remembered that Earl Haig was one of the founders and, until his death in 1928, the first President of the Royal British Legion and took an active interest in the welfare of ex-servicemen. Every poppy that is sold still bears his name at its centre. The decline in his reputation in the 1960s was not just about him but about questioning the purpose of WWI altogether as futile and unnecessary with no clear cause or causes that were ignoble. This was part of an overall attack on military intervention, the use of military power to check the ambitions of the communist powers and the morality of the Western Powers’ foreign policy, most notable that of the United States and the UK (no such questioning was made of the policy and means of implementation of the Soviet Union and Communist China). It was still dubious to question the morality surrounding WWII due to the nature of the opponents and the involvement of the Soviet Union (whose role was above reproach despite being initially allied militarily & economically with Nazi Germany) despite the fact that Churchill had called that war, not WWI, the “Unnecessary War” so WWI was a more convenient target both due to distance in time and due to the self-evident fact that it had clearly not been “the war to end wars” (ignoring that similar views as to the causes and course of WWI that prevailed in the 1960s led to the disastrous policy of appeasement, a prime cause of WWII). Earl Haig simply became the whipping-boy for this anti-military, anti-Western movement led by the academic movement which resulted in not only his memory being downgraded by his alma mater but also “all those other Brasenose men who devoted themselves at home or abroad to their country in time of peril”. 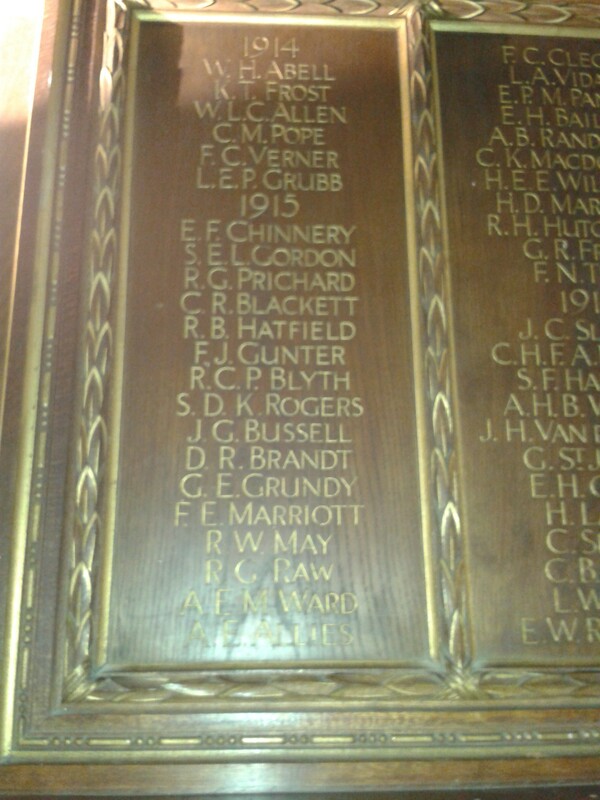 One hopes that the centenary of WWI might give academic institutions like Brasenose, which numbers the Prime Minister among its former students, time to reflect on the, largely false, attitudes it has engendered among the young not only regarding Earl Haig and WWI but on the role of Western Powers in the past century generally. Sadly, I doubt it will. Intriguingly the plaque has now gained its own sub-plaque. Yes, so I noticed (on one of my *very rare* visits to that remote part of the College). Very intriguing.